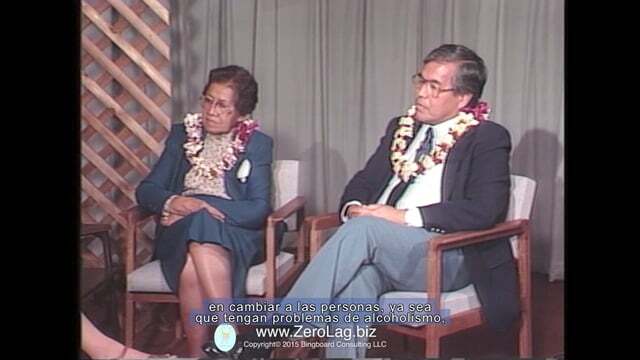 I've just enjoyed a 1987 video of Morrnah Simeona and Dr. Ihaleakala Hew Len conversing about Ho'oponopono, through Zerolag.biz. What a wonderful gift for a Thanksgiving weekend! Zerolag.biz is making this vintage 29-minute video rentable for $1.00, until Sunday evening 11/29/15. In it, Morrnah describes her familiarity with traditional Ho'oponopono, which translates from Hawaiian as "making things right." Morrnah shares that Self-Identity Through Ho'oponopono is her own process, updated for modern times. She remarks that she knew this in previous lifetimes as well. Morrnah believed we all have MANY lifetimes, and that their memory traces come with us wherever we go. In fact, this residue is the root cause of all problems everywhere. The entire conversation is beautiful to me, as it encompasses the parts of the Self, our relationship with Divinity, healing, and health issues like diabetes, addiction, and schizophrenia. It was filmed in Alaska, and the moderator asks some very useful questions. Both Morrnah and Dr. Hew Len emphasize that Self-Identity Through Ho'oponopono is a way to work directly with Divinity ourselves -- rather than appealing to others who, after all, have not created us. Making sure all three parts of the self are well-connected is the first step, and Ho'oponopono seminars explain how to do this. This process aligns us with our Creator in ways no other human can accomplish -- which may be startling for some, and liberating for others. We can each appeal to the Divinity within for cleansing and healing, even when we don't consciously understand the myriad issues showing up in our lives. For sure though, our Creator DOES know about them and their root causes. Dr. Hew Len describes some of his experiences with criminally psychotic patients at Hawaii State Hospital. Though employed as a clinical psychologist for 4-5 years, he did no talk therapy with these patients. Instead, he used Ho'oponopono processes to clean with his own reactions to their behaviors and histories. When other clinicians called them "crazy," he also cleaned with his own judgments about this rather than speaking directly with the people involved. He would ask the Divinity what he needed to do within himself in connection with each of these patients (and staff) so that Divinity could do His own work with them. This self-cleansing clears the way for Divinity to transmute all problems and symptoms -- which only Divinity can do, in His own time and rhythm. This may be one of the most difficult aspects of Ho'oponopono for us to grasp. Both Morrnah and Dr. Hew Len mention that people come into our lives in the present, because of old memories or data from the past. This is equally true of our parents, spouses, children, siblings, patients, and anyone else in our lives. When they arrive, it's an opportunity to let go of associated "stuff" within ourselves that might show up in any form including anger, hurt, judgment, physical symptoms, addictions, etc. We can ask Divinity to correct the errors we've unwittingly committed over time (all our shared previous lives!) that show up as these issues now. As we practice Ho'oponopono cleaning with each of these situations, the associated pain and suffering (manifesting as "problems") gradually lessens. Who knows how many layers we're dealing with though, or what level we're at in the process? Only our Divine Creator really knows -- and that's why we may think our Ho'oponopono isn't "working." No matter what appears to be happening on the outside, our best bet is to heal the relationship between the mother and child parts of ourselves on the inside. "That's the most important relationship in creation," says Dr. Hew Len. I work towards similar repentance, forgiveness, and transmutation in my personal relationships too. Morrnah Simeona and Ihaleakala Hew Len, Ph.D in Alaska from www.Zerolag.biz on Vimeo. Ho'oponopono is a process which can be used in ALL of life, not just sometimes. It can cleanse memories or data from us, which would otherwise show up as problems. The trick is to remember to DO IT. Even the most caring and genuine among us can sometimes forget. Ordinarily, Ho'oponopono preparations before an airplane trip would include gently talking with your Inner Child (or Unihipili) about where you're going -- and making sure s/he is willing to come too. You'd cover all the legs of the journey, offering protection and care. You'd do your "HA" breathing, to make sure all parts of you are connected and energized before setting out; you might use a specific cleaning tool as inspired, multiple times before leaving. Think of how you'd prepare a small child for such a trip, and you've got it. Usually I clean with each of the steps beforehand, from door to door -- and talk with the plane when I board. Sounds weird, I know; but I do. Planes are often grateful somebody notices what all they do. Sometimes for all of this, an abbreviated process is fine. I'd been at a coaching workshop in Asheville, and was very tired. The event ended on Friday evening, and I had a long flight home to Phoenix -- non-stop (so I thought) from Charlotte. Things began innocuously enough, and we even arrived in Charlotte early. But then, we had to sit on the runway for about 20 minutes because traffic was backed up. First sign of "uh-oh." Then we ended up parking at a gate at the very end of the "E" terminal -- making it a LONG sprint to my next flight. Coming inside, I checked the departure schedule for my next gate. There was only one flight to Phoenix listed -- showing a different flight number from the one on my ticket. Yet it was to leave within minutes of that flight. Feeling uneasy, I wondered whether the recent US Airways merger with American Airlines had caused some change they hadn't told customers about? With no other option, I scurried over to Terminal B. Arriving at Gate B12, I asked the agent for help. "You're the only flight to Phoenix this evening, but your flight number is different from my ticket. Can you please tell me if something has changed?" She looked puzzled, called her manager, and then told me the flight on my ticket was at Gate D6. Indeed it wasn't listed on the departure screen, but she assured me it existed and was boarding now. Huh? A "secret" flight? And yikes! This meant streaking back across the airport -- where crowds created a nightmarish obstacle course. As I zipped and maneuvered through folks with rollerbags, I'm sure I was part of somebody else's nightmare too. Breathlessly jogging to Gate D6, I found the boarding well underway. The flight number was correct, but the destination was Dallas-Ft. Worth! No mention of Phoenix at all. Handing my ticket to the gate agent, I asked her about this. With an exasperated tone of voice, she told me, "It goes straight through to Phoenix, ma'am." The crowd shuffled along obediently, me with it. Finding my seat, I promptly fell asleep. Still no cleaning, and no talking with the plane. Woke up realizing I was hungry, and asked if they were selling those chicken wrap sandwiches they advertised? "Oh no -- all we have is snacks, ma'am." None of them looked appealing. Arriving in Dallas, we taxied to the gate. The steward FINALLY mentioned that any passengers going on to Phoenix should get off the plane and re-board. So I did -- and was still hungry. It was 10pm in DFW's airport. What quarry might there be? Some corn chips in a vending machine. Yes, I confess to eating them. May my Unihipili forgive me. Back on the plane an hour later, there were babies crying as if their little hearts would break. I finally said "Ice Blue" -- first sign of cleaning all night. Fell asleep again, exhausted. Once in Phoenix, everyone migrated to the baggage carousel -- and waited, and waited, and waited. Finally it started up, letting out 3 bags . . . then stopped for about 20 minutes. Then started again . . . producing nothing. People paced, rumbling in low voices to each other. It was 12:45am, and even college co-eds looked bleary-eyed. After another 10-15 minutes, a baggage handler guy popped up from the chute, and started hauling bags up onto the carousel by hand. 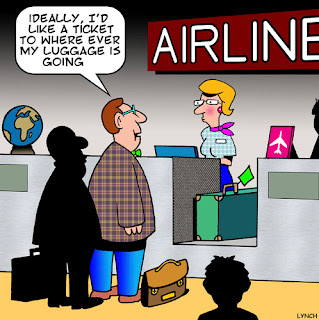 I could just imagine the work he had ahead of him, doing the whole flight's luggage that way. I said to myself, "Ice blue." From somewhere in the ceiling rang a voice: "Ladies and gentlemen, there's been a -- a baggage jam -- for Flight 894. We ask your patience while we get your luggage to the carousel." Then they announced a change to another carousel . . . which released a few more bags. While this was happening, bags started appearing (unannounced) on the original carousel. Everybody shuffled back and forth to collect their belongings. I waited until the last bag came . . . and mine was not there. By now it was around 1:20am -- and those of us remaining had to search out the baggage office. Long line there, and only 1 agent at first. Then 2 more materialized. My turn came, and I told the nice lady that my bag had a purple ribbon tied on the handle. "Purple?" she repeated. "Purple," I said. She disappeared into the bowels of baggage claim -- and came out with my bag! "Where was it?" I asked. "Back in our office," she replied. "No -- I mean it wasn't on the carousel," I said. "Well, it got here before you did." "Before me?" "Yes -- they put it on the other flight from Charlotte and it arrived 2 hours ago." 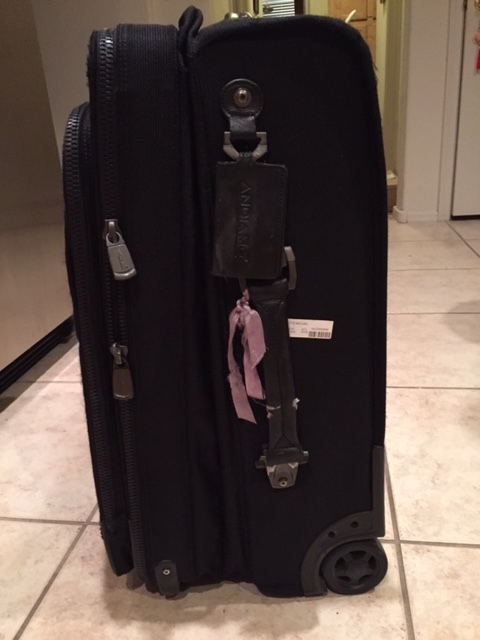 This means my luggage got the non-stop trip to Phoenix, that I thought I had purchased when buying my ticket. The flight number it rode in on, left from the first gate in Charlotte that I'd tried (and failed) to fly out from. So this, my friends, is what happens when you forget to do your cleaning. 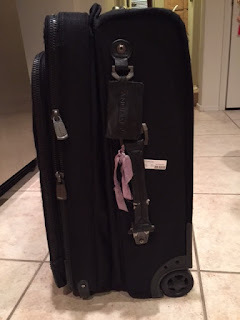 I'd started to feel irritable with the airline -- but suddenly, when my bag didn't show up, I realized the truth. I thought of Morrnah's leaving so many wonderful prayers and processes for us. I remembered Ihaleakala, Kamaile, Mabel, and everyone else who has ever taught me how to clean. What a night of, um -- accentuated learning! My Inner Child and I went home, holding hands with our suitcase. I'd say it did a better job cleaning than me. :-) And I'll do my job next time, for sure.